Why shoes, you might ask ? Apart from the obvious analogy of stepping into different feet, shoes represent a universal product that symbolize the perfect marriage of functionality and aesthetic while also reflecting individual personalities almost seamlessly. This is why I decided to illustrate my design process through the versatile and yet humble analogy of shoes. I believe the key to success is empathy at every stage of an idea. The ability to place yourself in the feet of others who will all interact with your idea (or product as the case may be) through their unique lens is key to gain new perspectives and add value to every stage of the process. This journey will impact meaningful change and allow for the creation of something that more people can relate to, engage with and feel a part of. Taking this thought further, once you get a brief or even just stumble upon an idea with potential, consider all the different points of view and perspectives that need to be gained in order to become an effective designer, marketer or communicator as the field may be. 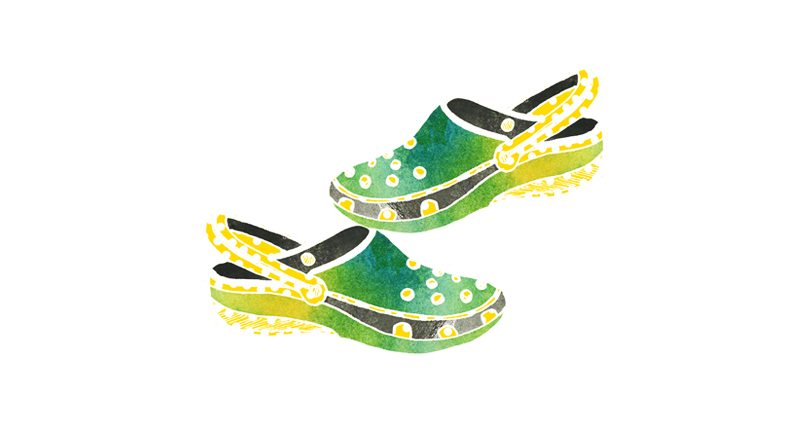 Consumers, much like Crocs come in all shapes and sizes. All too often, the work of designers and marketers involves anticipating the unarticulated needs of consumers even before they comprehend what that might be. Placing yourself in the shoes of potential consumers is always a wise way to consider if it is an appealing idea and how it might be perceived in a crowded market place. Does it externally reflect all that you envisioned it would and what might it’s core value be? The integral work of a researcher is often unglamorous and behind the scenes but entails such a crucial and unavoidable part of any process. Insights thus garnered enable a smoother design process, helps fix gaping holes and identify potential proportunities (problems that could lead to opportunities). Thinking like a researcher is vital so one may consider how easy/difficult it is to reach your target. How long might this take? Essentially, what is the crux of it all- the real problem you are creatively attempting to solve? 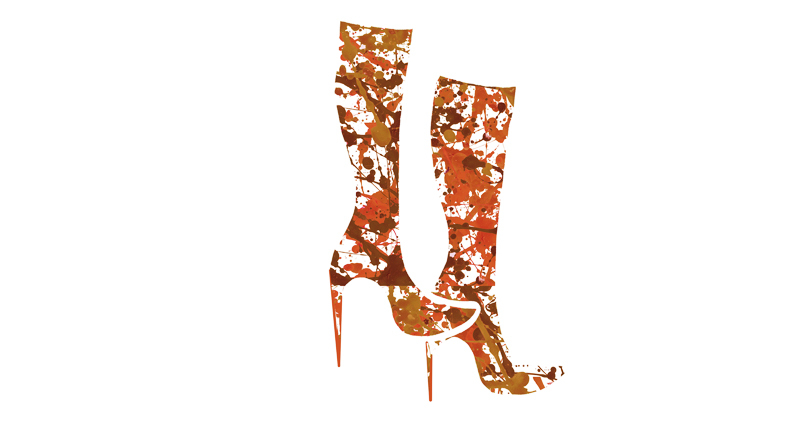 High heel boots: Get Knee deep in ideation. Obvious Functionality + heels which represent the Visual/Aesthetic elements. Thinking like a designer is an empowering stage, at least to me, as this is the stage I can directly relate to the most. At this point, the world is literally your oyster (pearl included). Unfettered by convention and all that exists, dream the impossible. However, through this beautiful phase of reaching for the stars, remember the shoes you are in. These heeled boots symbolize functionality and aesthetic at once. While one has to be willing to wade knee deep, explore and detail every nitty gritty that exists, every step of the way it is worth redefining the intentions and thoughts behind the idea and execution constantly looking at it all afresh. Clients, much like consumers come in all shapes and sizes. 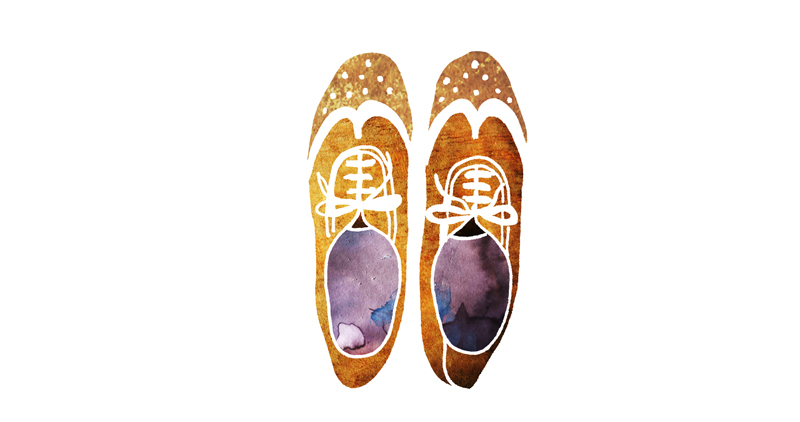 I’m using Oxfords to represent this genre as clients too have evolved a lot since the days when these traditional shoes emerged in their classic form and are now concerned with a variety of new and relevant issues. Oxfords range from formal to casual and everything in between. Each client is unique and require different outcomes from projects. Thinking like a client is very helpful as the unbiased lens of an invested outsider can help zoom into the specifics that need to be fixed. It can also prove a useful tool in defining and perceiving created value. It is no secret that dreams require collaborations and the collusion of numerous different skill sets to be materialized in a tangible way. To this end, caterpillar shoes which are rugged workman shoes symbolize the hard work and the toil that goes into creating products and the ideas that endure representing quality for years to come. Being able to think like a manufacturer can often help simplify unwanted convoluted steps and cut right to clean, cost effective solutions that are also pragmatic and contextual. Now imagine you have created this fantastic idea/ product that you truly believe in. What’s next? It’s the job of marketing specialists, communicators and advertisers to make the world see the value that you do. Sneakers are durable, hardy and always on the move akin to this inspiring genre of people who have the reach and influence to communicate and convey the potential in your product. Placing yourself in their shoes can help you focus on the core benefits of your offer, how easily it is translatable or universal and how can you break it down into a simple comprehensible idea that people from all walks of life can relate to. The bottom line is the real world is a rough place to be in outside of the hallowed protected walls of school. There will always be someone bigger, maybe even better and definitely with something flashier than you have. If you have conviction in what you do, that will never be a deterrent. In fact, competitors can often be a great learning tool. You don’t have to make every mistake in the book and touch fire to feel its heat. All you often have to do is look around to see missed opportunities, lessons and the things that could be done differently to build on those areas and create your own path. You learn as much as from failure as you do from success and perseverance might just make all the difference. Perspective theories in art/ design drawing/ architecture state that objects set at different angles each have their own vanishing points. In my personal view, design thinking is much the same way. If you aren’t successful in looking and dissecting an idea from every possible angle, very soon it just might disappear into the ether of the distant horizon. Lets think up some big ideas together, shall we? Unexpectedly stumbling upon old forgotten projects is somewhat similar to finding money in an old coat consigned to oblivion. No doubt equally gratifying! That was precisely what I felt when I chanced upon these place mats designed nearly five years ago. It began as an experiment dabbling with a variety of textures- weaves, prints, laminated paper and reeds. Tinkering around with all that I could find in my earlier studio, it was a lot of fun to create this playful and harmonious collection of dining mats intended to protect any surface. I hope you guys like them as much I enjoyed walking down memory lane through these images. "It is not enough to be busy. So are the ants. The question is: What are we busy about?" Henry David Thoreau Yes- I have nothing to blame but having been "busy" for not uploading a blog entry earlier. To make amends, I shall in today's post show you what this lil ant has been upto. Earlier this week I got thinking about business cards and the fact that mine was in desperate need of being updated. After a lot of random doodling, pinterest searches and scouring the web with no particular aim, I had my eureka moment when my husband and I suddenly decided to pep up our rather dull day with a game of playing cards. 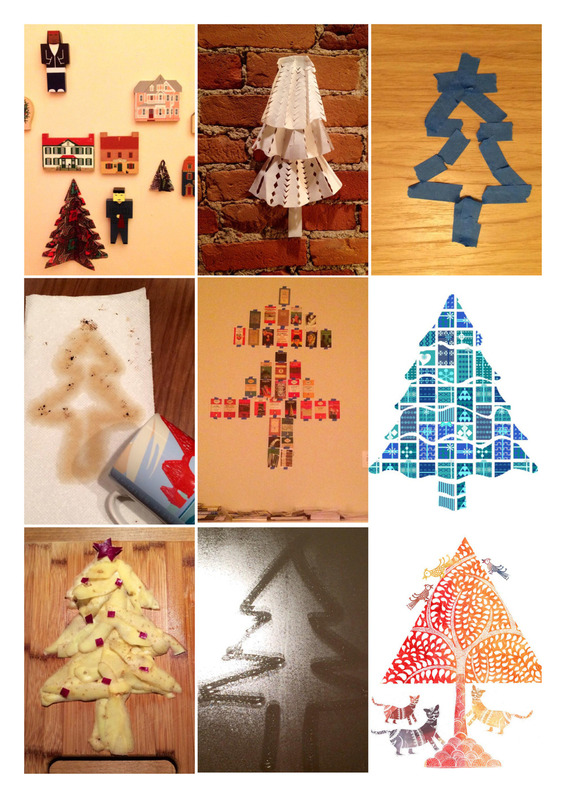 Soon after, I got to work and below are some images of my journey. I wanted my card to be fun and reflect the dual aspect of the work I do which often combines visual and creative elements with research and strategic insights to generate new ideas. There's nothing quite like my sister's inspiring home surrounded by the loveliest woods to get my creative juices flowing again. Below are onesies (incidentally the greatest garments ever designed) created for my baby niece with some snapshots of the process detailed below. As her name starts with M, one of the onesies has silhouettes of some fun animals that begin with the same letter namely Mongoose, Meerkat, Moose, Mackerel, Mouse, Magpie, Manatee and Monkey. Can you spot them all? My husband, a writer, returned from a recent trip with this beautiful collection of book cover postcards. Fresh from the experience of an exhibit by Barry McGee at a museum nearby, I decided to try my hand at decorating our bedroom and workspace with these beautifully illustrated covers rich with storytelling. The postcards have been stuck with removable painters tape in a random assortment extending from the ceiling to the vertical wall. Painter's tape was a cost-effective (and easier) alternative to frames for putting up so many different images and the pop of blue color that holds it all together does provide some edginess. The imperfect pixel postcard composition with colorful covers instantly converted our routine space into something dynamic and fun!